Last weekend, we drove to upstate New York for pancakes. Not just for pancakes. Pancakes and maple syrup. 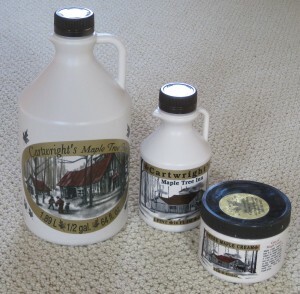 We met H’s family at Cartwright’s Maple Tree Inn, a glorified sugar shack located, really, in the middle of nowhere. 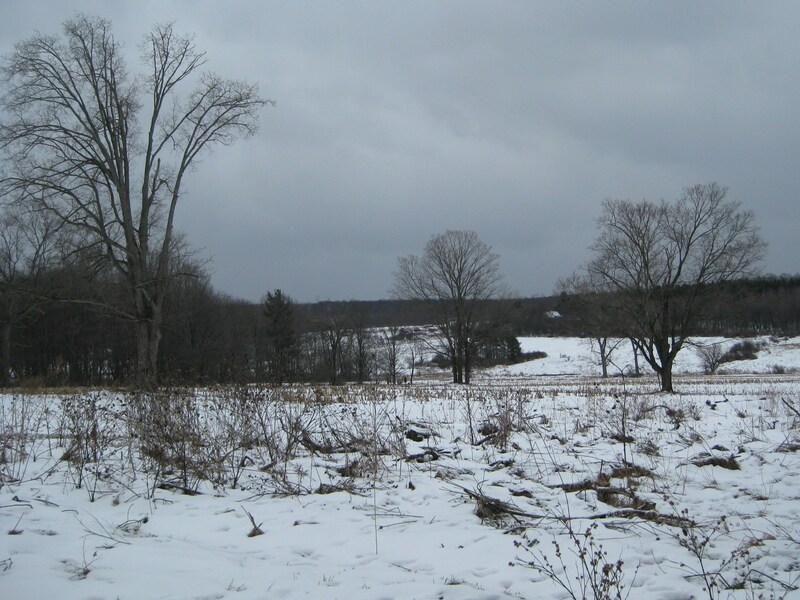 Its actual address is County Road 15A, Angelica, NY (2 miles from Short Tract), which, in the language of our GPS system, is “not on any digitized road.” Despite its truly out-of-the-way location in the midst of snow-covered fields, it’s a popular spot, with big crowds on weekends. It’s only open during the maple sugar season, which typically runs from mid-February through March or mid-April, depending on the weather. H’s family has been trekking out to Cartwright’s for decades, and now it’s among our winter traditions, even though our drive is far longer. Of course, we don’t return directly to Virginia, but spend the weekend visiting H’s family in Rochester. The Cartwrights began producing maple syrup on their farm in the 1850s. The Maple Tree Inn dates from 1963, when the family decided to build a restaurant specializing in Grandma’s buckwheat pancakes served with their own maple syrup. In the adjacent shop, the syrup, maple butter and maple sugar cakes became available directly to the public. The somewhat ramshackle building has been expanded over the years and is now fairly large. It will win no awards for architectural style, but that’s not the point. In the chain-store sameness that dominates so much of our country today, the Maple Tree Inn offers a unique, quirky, authentic experience. It’s living history, and it’s worth a visit. Before I met my husband, I had never tasted true maple syrup. The first time we ate together at PJ’s Pancake House in Princeton, I was surprised to see him pull a small container of pure maple syrup from his pocket. At the time, PJ’s didn’t serve the real stuff, although that has since changed. I didn’t understand what the big deal was. Growing up, when Daddy made pancakes on Saturday mornings, we used the typical supermarket syrup–Log Cabin, Aunt Jemima–whatever. H was no food snob, so I found his insistence on unadulterated maple syrup mystifying. That is, until that day at PJ’s, when I tasted the liquid from that little jar. H was right. There is no topping the perfection of the stuff that comes straight from the tree. Visitors to the Maple Tree Inn are welcome to descend into the building’s lower level to learn how the sap is boiled down, in huge wood-fired evaporators, to its golden maple essence. Several years ago, a Cartwright grandson, no more than twelve or so, gave us a comprehensive tour that began in the frozen fields where we could examine the taps on the trees and see the liquid running into the buckets. As far as I know, this is not an option at IHOP. These days, the rarified nuances of maple syrup, like those of chocolate, coffee and small-batch whiskies, are earnestly discussed at considerable length, using wine-lingo terms such as terroir. H doesn’t do this, although he can and does enjoy discerning, in blind taste tests, the variations between light, medium, and dark amber syrups. My palette will never attain such a degree of sophistication, but I can say this: a little true maple syrup makes life sweeter. 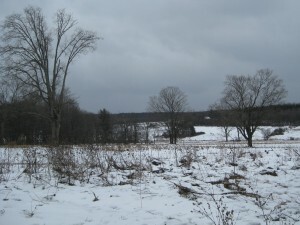 The snowy landscape behind the Maple Tree Inn. Kiko and I walk through the surrounding fields before I join the others for lunch. 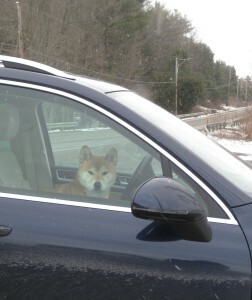 Kiko keeps vigil in the car during our meal. Animal advocates need not be alarmed–he has his sheepskin bed and blanket if he needs to hunker down for warmth. Before this trip, in case it was particularly cold, we bought him a red plaid fleece coat. The temperature wasn’t low enough to warrant it, and he appeared perfectly comfortable, peering out from the front seat, when we returned. For his wait, he was rewarded with an extra sausage patty H’s grandmother had carefully saved for him. 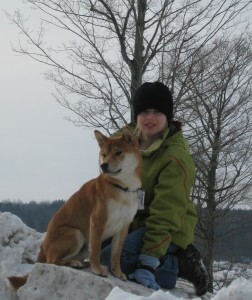 Kiko and D atop a tall snowpile on an earlier visit to Cartwright’s, in 2009. 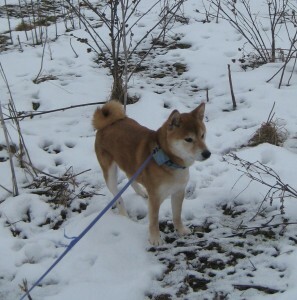 Kiko looks almost exactly the same as he did four years ago, when he was two. D, on the other hand, has changed. We stocked up at the Maple Tree Inn.